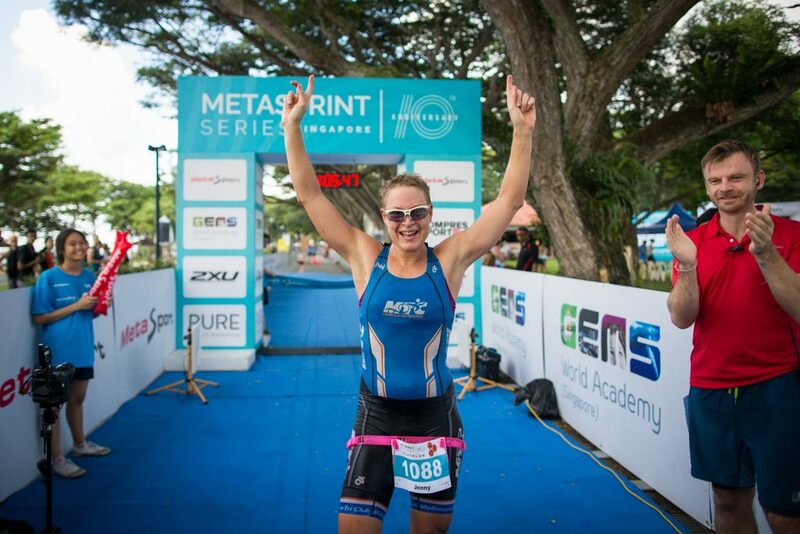 The 10th anniversary MetaSprint Series concluded in spectacular style at Singapore’s East Coast Park on Sunday as Jennifer Zenker and Colin O’Shea came out tops at the 2017 MetaSprint Triathlon. Their swim-bike-run victories also saw them crowned the overall MetaSprint Series queen and king and for Zenker there was icing on the cake in the form of clinching the coveted Champion of Champions title. A beautiful, sunny morning greeted the 2,000 athletes who gathered for the big race, at the East Coast Park’s Angsana Green, the traditional home for triathlon in Singapore. Up for grabs was a clutch of elite and age-group podium places for the Triathlon but also those all-important overall series titles. The MetaSprint Series comprises three races, an Aquathlon, a Duathlon and a Triathlon happening respectively in February, March and April each year. The overall series rankings are calculated on a “two out of three system”, with points earned in the Triathlon and either the Aquathlon or Duathlon. First to hit the water on Sunday were the female Elite athletes who splashed off at 8am sharp. Zenker and the other leading ladies were given a 5-minutes-and-45-second start on the Elite men as part of the Champion of Champions, a “battle of the sexes” race within a race; using the previous year’s results, a gender handicap was calculated for each leg of the series. O’Shea overcame the handicap to win the Champion of Champions title at February’s MetaSprint Aquathlon, but Zenker had comfortably held off the men in taking the win at last month’s MetaSprint Duathlon. It was Zenker who handled the choppy conditions best among the elite women, emerging from the M-shaped swim course some 20 seconds ahead of Rebecca Round, with Aquathon winner Christy Suriadi just behind Round in third. But that was as close as any of the women got to Zenker for the rest of the morning, as the German athlete used a superb cycling split – she covered the 18km middle leg in a time of 28:22 – to increase her lead to over 3 minutes by the time she hit T2. Incidentally, after over a decade of triathlon races being staged at the Angsana Green location, race organisers MetaSport switched the direction of the 6km bike circuit from clockwise to anti-clockwise, giving the athletes a different perspective during their three trips round the course. Both Round and Suriadi faded on the bike, allowing the Hungarian Anna Eberhardt to move into second place heading out onto the 5km run course, which was also a spectator-friendly, two-lap affair. Zenker was well clear of the other women as she hit her running stride but with her sights also firmly set on winning the Champion of Champions crown, she didn’t let up her effort for fear of O’Shea or any other man catching her. She needn’t have worried as she crossed the line well clear of all competitors. Her winning time of 1:05:26 gave her a winning margin of almost 90 seconds from the runner-up Eberhardt, who incidentally also held off all the men. The final step on the women’s Elite podium went to Suriadi. Zenker was obviously happy with her morning’s work. But Zenker revealed that her winning performance wasn’t quite the stroll that it appeared to be from the sidelines. “It was quite tough. The swim was very rough at the beginning, we were really close for the first 200m, with a lot of girls, but then it cleared up and I had my space, so the swim was pretty good. I just went at my pace and came out first from the water but I saw that there were I think two girls still quite close,” she said. After her lightning fast trip around the bike course Zenker knew she was in the lead but wasn’t sure by how much. “I had no idea where I was, how much was my lead compared to the other girls, or to the men. On the last turnaround on the second lap when there was just the final 1.5km left I saw a man about 300 metres behind me but I had no idea if it was the leading man or somebody from another wave, so obviously the only thing I could do was push it as hard as I could and that’s what I did and yeah, I won,” she said. Zenker, who’ll be back racing at the Bintan Triathlon next month, needn’t have worried, as she finished some 100 seconds ahead of O’Shea in the battle of the sexes. O’Shea and the other men were always facing a formidable task to catch the leading ladies, but their focus was no doubt more on each other as they took their turn to line up on the beach. It was the cadre of young swim talent from the Second Wind Academy that set the pace at the front of the field, among them Bryce Chong, Zacharias Low and Aaron Kiss. But the Irishman O’Shea was right behind the youngsters as they entered T1 and it didn’t take him long to move past them all and into the lead during the first lap of the bike. O’Shea steadily pulled away from the strong swimmers as the bike leg progressed, and it was Tim Cosulich who emerged as his main rival for the win, as on the bike the Italian had cut in half a 1-minute deficit after the swim. Low was the next fastest man, 20 seconds back from Cosulich. While the Italian was running slightly faster than the leader, O’Shea looked well in control and the win never seemed to be in doubt. He duly crossed the line for the victory in a time of 1:01:23, giving him a comfortable winning margin of 43 seconds. Charging through the field to clinch third place was James Middleditch. An easily fastest-of-the-day bike split of 26:46 brought him back into contention after an average swim, and then another superlative performance over the run leg saw him chase down a bunch of other strong athletes to claim the final spot of the podium. But triathlon is about excelling in three sports, and that’s exactly what O’Shea did on Sunday, and the Irishman was happy with his morning’s work. “The race went great, although it was actually a tough swim today, there was a bit of a current out there. But I was still very happy to come in just a few places behind some very fast Singapore guys. I went into transition and onto the bike and yeah, I was happy with how the bike went. I passed some of the guys from the swim on the bike and maintained a bit of a gap and I knew Tim Cosulich was behind me so I had to continue to push. I got into T2 ahead but I knew that Tim was still quite close behind so I continued to push on in the run, and thankfully I had enough of a gap to keep it as it was for the rest of the race,” O’Shea said post race. “I didn’t quite catch the female leader in the end. I couldn’t see Jennifer at all, she was too far ahead. I think the five minutes something that she had was a bit too much. But the leading women are very strong athletes and they obviously pushed to the end, and those were really, really good performances from Jennifer,” he added. While the elite races at the MetaSprint Series races provide great entertainment for the spectators and other athletes waiting their turn to race, the cream of the crop only made up a small percentage of the total numbers that once again showed up in droves for the MetaSprint Aquathlon, Duathlon and Triathlon. Well over 1,000 alone raced the Sprint Distance races on Sunday, while hundreds more competed in the Discovery, Youths, Kids and Relay races. A big crowd also gathered on the sidelines, with the race village a bustling hive of activity. The Youth and Discovery races were contested over a format comprising a 250m swim/12km bike/2.5km run. Over the past 10 years, many of the current big names in Singapore multisport cut their teeth in the MetaSprint Series Youth (ages 12 to 15) and Kids (ages 8 to 11) races and so all eyes were on Sunday’s contest to see the next crop of talent compete. In the male Youths, exciting young Kiwi prospect, James Corbett, was a comfortable winner over Jay Lilley and Matthew Trott, while Emma Middleditch finished nearly five minutes clear in the female Youths race. The runner up in that race was Herlene Yu, who just prevailed over Enola de Smet. Middleditch incidentally, was the fourth-fastest Youth across both genders and just 8 seconds slower than Trott. It would have been interesting to see how well she would have fared in a head-to-head contest with the boys. Closing out the 2017 MetaSprint Series were the boys and girls of the Kids categories, who were set a 150m swim/6km bike/1.5km run test. The boys contest presented perhaps the best race of the day with Marc Feddal having to chase down long-time leader Lodovico de Ferrari in the closing stages to win by 3 seconds. Kobe Gaytant was the third-fastest boy. The girls race was another thrilling affair, with Harriet Strand holding off a fast-charging Adele Clarsen for the win. Eugenie Van Wersch took third place. Many of the kids, youths and adult athletes present at the East Coast Park on Sunday will move onto the next big triathlon on the local calendar, the Bintan Triathlon. That iconic festival of multisports takes place from May 19-21. With registration closing soon, check out www.bintantriathlon.com for full information and to sign up. For full results of the 2017 MetaSprint Series, click on this link. The MetaSprint Series will be back for its 11th year in 2018: Aquathlon 11 February, Duathlon 11 March, Triathlon 15 April.